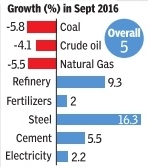 Core sector growth rebounded in September posting a steady growth on the back of rising output of steel, refinery products and cement sectors. The eight key infrastructure sectors spanning coal, crude oil, natural gas, refinery products, fertilizer, steel, cement and electricity grew an annual 5% in September, faster than previous month's 3.2% expansion and higher than 3.7% growth in the same period last year. The eight core industries comprise nearly 38% of the index of industrial production and any revival in these sectors augurs well for overall industrial growth. Cumulative growth during April to September 2016-17 was 4.6 %. Industrial output has contracted for two successive months, although data has remained volatile attracting calls for revamping it. Robust growth in steel sector lifted overall numbers.Steel production, which has a weight of 6.68% in the core sector, increased by 16.3% in September compared to the year earlier period. Coal, crude oil and natural gas sectors remained the laggards as they contracted in September.